Plywood is used in many different areas, from the production of doors and furniture to the aviation industry and shipbuilding. There are different grades and types of plywood, each of which has a specific purpose. After reading this article, you will have a complete picture of all the plywood plates offered by the modern construction market. The performance properties of plywood largely depend on the substance used to glue the sheets. 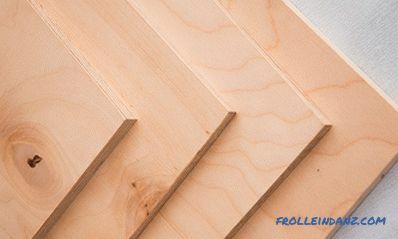 The quality of the impregnation affects the indicators of moisture resistance and environmental friendliness of plywood, as well as its ability to withstand temperature fluctuations, humidity and other external influences. Based on used in the manufacture of adhesive components, there are many brands of plywood. FBA is the least resistant material to a moist environment. However, the use of albumin casein glue makes it absolutely safe from an environmental point of view. 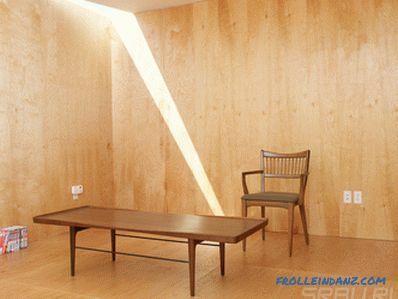 Such plywood is suitable only for rooms with low humidity levels. In particular, it has found its application in the production of furniture, and is also used to create all sorts of decorative elements of the interior. FC is a material with relatively low moisture resistance. 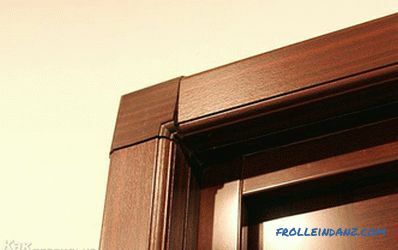 In this case, the function of the binder is performed by a carbamide adhesive that does not emit harmful substances, which makes it possible to use this type of plywood for interior finishing work. At the same time moderate level of humidity is allowed. 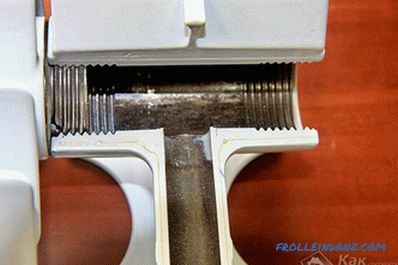 FKM - veneer sheets interconnected with melamine glue. According to the degree of moisture resistance, the material has average values. 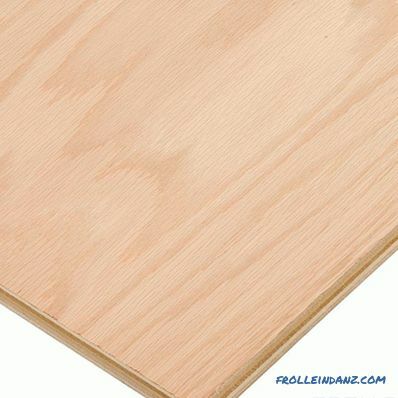 FSF - especially durable wood boards, layers of which are impregnated with phenol-formaldehyde resin. The material is able to withstand heavy loads and resist moisture. However, the amount of toxins contained in the adhesive composition makes it possible to use such plywood exclusively outside the premises. In particular, it is ideally suited for the cladding of exterior walls in frame housing construction, the erection of enclosing structures, and the manufacture of outdoor furniture. FB - a material in the production process of which bakelite glue is used. Sheets impregnated with such a composition are characterized by high moisture resistance and are able to withstand almost any temperature conditions. Impregnation reliably protects wood from negative environmental influences, which allows using this type of plywood in almost any sphere. In this case, plates of type FB may have characteristic differences, depending on the composition of the adhesive substance and the sizing technology that affects their characteristics. FBS1 - plywood plates, in the manufacturing process of which the method of veneering sheet veneer sheets is used, thereby reducing the quality indicators of the material; substances that involves processing is lyuchitelno longitudinally arranged sheets. Another type is plywood, in the manufacture of which water-soluble adhesives are used. Plywood, with the internal layer treated with a layer, but at the same time impregnated with external sheets. 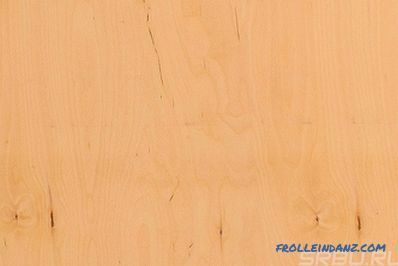 Plywood plates with the marking FBV1, for all layers of which only the method of coating is assumed. To date, five varieties of plywood are defined by GOST standards, differing in the presence of certain natural wood defects or formed during its machining. Grade E is a high-quality elite material designed primarily for finishing. 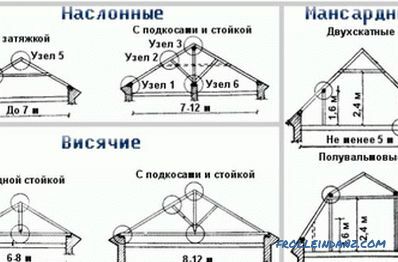 The presence of any extraneous inclusions, as well as all sorts of deformations, except for minor deviations in the structure of wood, which are random in nature. 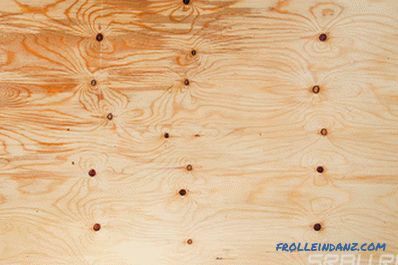 Pin knots on coniferous plywood are allowed, but not more than 3 pieces per 1 m 2 . The aesthetic perfection of plywood E makes it the most expensive of all materials produced. 1 is a grade for which some defects in the form of knots, light porosity, repair inserts for embedding knots are permissible. Such wood boards are used for both internal and external finishing works. 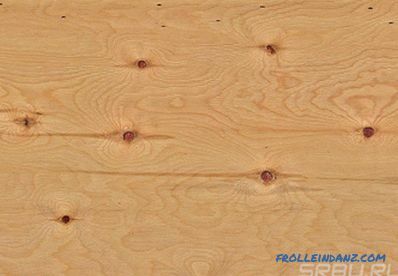 2 ​​is a grade of plywood in which there can be cracks up to 20 cm, and small repair inserts are allowed for patching knots, knots and wormholes, light and dark porosity. Adhesive infiltration in certain areas within 2% of the total area of ​​the plywood sheet is permissible. 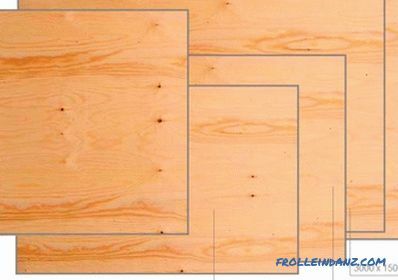 3 - the grade of plywood is in many ways similar to the second grade, but here the restriction on the number of closed cracks and the number of coniferous plywood knots is lifted. The maximum possible knot diameter is increased to 70 mm. In the conditions of finishing these defects can be hidden with the help of special paints and varnishes. 4 is the grade to which the lowest quality and most affordable materials belong. In the production of wood can be used with numerous flaws, including wormholes, as well as non-accrete falling knots. Irregularities of the edges of glued sheets with deviations within 0.5 mm are allowed. The main purpose of such plywood - the production of packaging materials. However, it is often used for roughing indoors. One of the parameters by which this material is classified is the technology used for manufacturing the exterior surfaces of plywood used in production. Based on this criterion, there are several types of plywood. 1. Unpolished (NS) - the outer surface of the veneer is not subjected to additional processing, as a result of which it has a rather coarse structure. The risk of cracking increases. 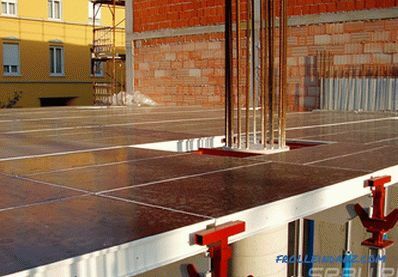 Mostly similar materials are used for rough work, where the state of the surface of the plates does not matter. 2. W1 - polished plywood, which is processed on one side. Practically not prone to cracking. 3. Ш2 - the material which is exposed to polishing from two parties. The ability to absorb moisture is minimized. 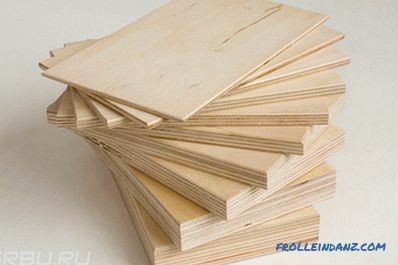 As in the cases with Sh1 plywood, it can be used for finishing works, as well as in the manufacture of decorative products and individual structural elements of furniture items. 4. 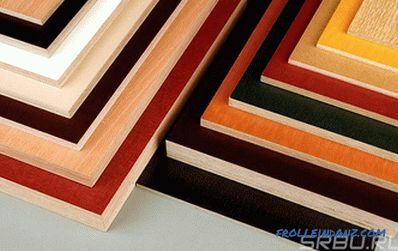 Laminated plywood sheets for the treatment of which special resins are used, containing phenol and melamine. Also relevant is the application of PVC film to the surface. In this way, the moisture resistance of the material is improved. 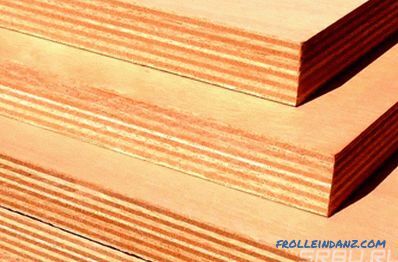 Lamination prolongs the service life of wood-based panels. In addition, the surface looks quite aesthetic. Such plywood is often used in the arrangement of interiors. 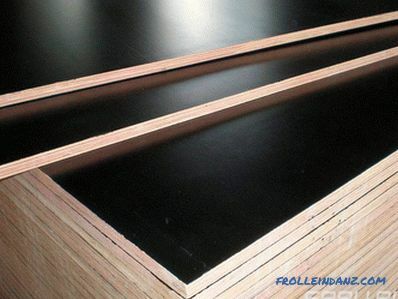 Since such material as formaldehyde is used in the manufacture of wood-based panels, a generally accepted scale was developed, which determines the level of permissible formaldehyde emission. The level of emission of harmful substances plywood can be classified as class E1 or class E2. Class E1 includes materials emitting no more than 10 mg of a harmful substance per 100 g of dry wood. Such indicators are considered acceptable for the use of plywood in a residential environment. 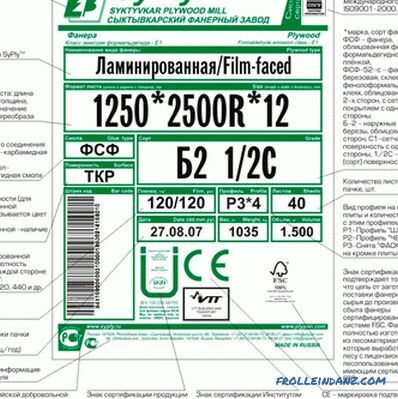 Plates of class E2 are recommended for external use only, since the emission level can reach 30 mg. However, some unscrupulous manufacturers often indicate in the annotations to their products a class that does not correspond to reality. Using such materials in certain conditions is quite risky, so it is advisable to give preference to proven manufacturers. 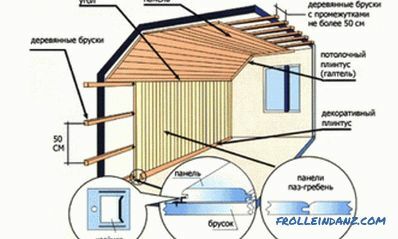 According to the composition of the raw materials, all the plywood offered today can be divided into three categories. The hardwood from which plywood sheets are made is primarily birch. The veneer made on its basis is distinguished by an increased density and uniformity of the structure. At the same time, in comparison with other types of materials, strength indicators are higher on average by 20%. The only conditional minus of birch plywood can be considered its value, which is higher than that of softwood plywood. Slabs made of hardwood are in demand not only in private construction. 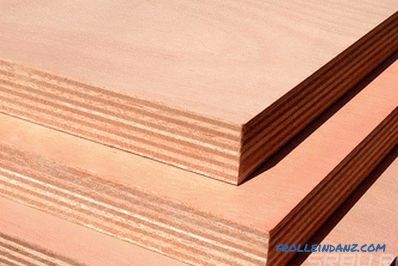 Similar types of plywood are used as packing elements for cargo transportation, shipbuilding and car building, as well as in different areas of the automotive industry. Coniferous wood, as a rule, is cheaper. Domestic manufacturers of such plywood mainly use pine with high strength. The finished products are quite light, and the natural woody design adds to their aesthetic appeal.Due to the presence of resin of natural origin, the material has a longer operating period. 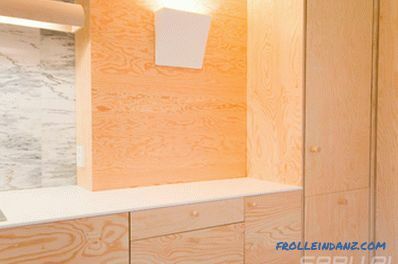 Softwood plywood has found its application in housing construction, and is also actively used in arranging interiors of residential premises. 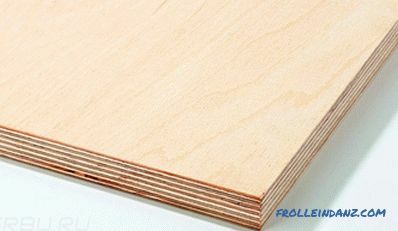 Combined plywood sheets include both hardwood and softwood veneer. This combination allows to reduce the cost of products, with virtually no damage to their quality, since the technical characteristics are as close as possible to sheets made of birch. Basically, such plywood is in demand in the field of furniture production. Plywood boards are used not only in the construction of buildings and interior decoration. The scope of their use is much wider. Differs in wear resistance and is also environmentally friendly. 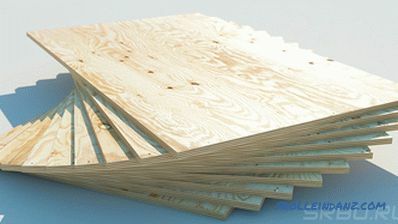 In most cases, this is combined plywood FC, acceptable for use in conditions of moderate humidity. Birch-based slabs are ideal for almost all types of rough finish. 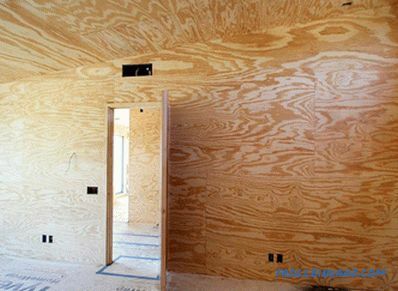 Due to its high strength and moisture resistance, FB plywood is capable of being in an aggressive environment. 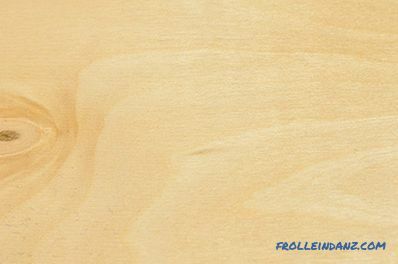 As a rule, high-quality veneer varieties are used in the production of plywood for finishing interior finishing. In this case, ideally smooth external surfaces of the outer sheets, which are also visible textured patterns. 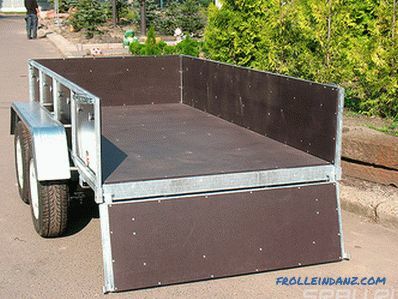 With the help of FSF plywood sheathe body elements of trucks. The slabs, as a rule, have a laminated and sometimes mesh-ribbed outer surface. In shipbuilding, moisture-proof sheets of FB, in the production of which bakelite adhesives are used, are in high demand. 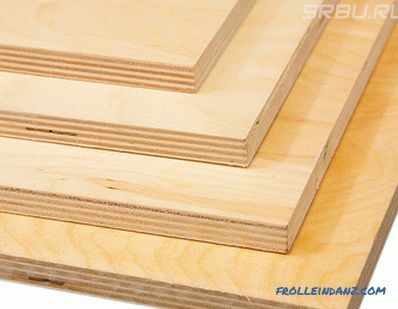 The standard width of plywood sheets can be either 1220 or 1525 mm. 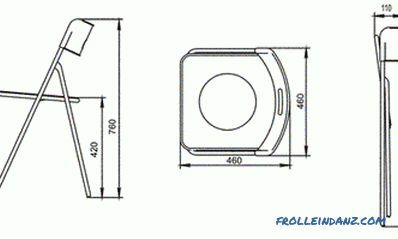 The minimum length is equal to 1525 mm, and the maximum - up to 2500 mm. Modern manufacturers mainly offer rectangular plates with a size of 2440x1220mm, as well as square ones, the sizes of plywood sheets for which are 1525x1525mm. Exceptions are large-format products for which the allowable length can reach 3050 mm. The thickness of the plywood depends primarily on the number of layers. According to the requirements of GOST, there are regulated minimum and maximum - from 3 to 30 mm. At the same time there are approved standards that allow some specialized enterprises to produce slabs with a thickness of 1 mm. Country of the manufacturer of the building material. Trademark of the manufacturer or brand name. The exact number of items in the package. surface treatment method used in production. Knowing all the listed features of plywood boards, you can easily choose a material that fully meets specific needs.